Slow cookers are popular for good reason: They’re the ultimate kitchen problem solvers. If you’re watching your budget, they’re well worth the $30 they cost since they can turn the cheapest cuts of meat into unctuous, mouth-watering results worthy of a five-star restaurant. Slow cookers also do the hard work, cooking for hours while you’re out of the house only to come home to a meal just about ready to eat. And since slow cookers keep food warm, they allow different family members to eat at different times: a practical option in a world of staggered schedules. Yet, slow cookers have an image problem. Most home cooks use them for cold weather meals only, while others think slow cookers can only produce food that’s mushy, bland, and watery or rely solely on shortcut ingredients like spice packets, bouillon cubes, and bottled sauces. No longer does this must-have kitchen tool deserve to be stored away when spring months hit. 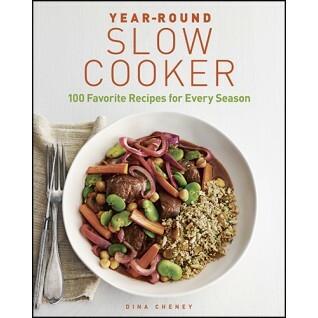 In Year-Round Slow Cooker, home cooks will find 100 delicious, modern, practical slow cooker recipes featuring seasonal produce. Recipes speak to the home cook whose palate is more sophisticated and who wants to incorporate seasonal produce into all of her meals. Organized by season, Year-Round Slow Cooker features notes about the featured seasonal ingredients as well as invaluable tips throughout to help cooks maximize the power of the slow cooker. The description says it all; when I first tried to find recipes for my new slow cooker, they were all for simple stews, soups, pulled pork, or chili. Cheney includes more innovative, different recipes that will give some variety to your meals. There are recipes for things like ribs, puddings, brisket, chicken, and lots of other types of meals and desserts. I've tried a few of these and haven't been disappointed. The layout is fantastic -- very easy to read and follow. I like the idea of categorizing meals by seasons, though I'm not typically the kind of person who pays attention to seasons when planning a meal. However, for those who buy from local farms, this will be useful because each season includes produce that will actually be available. Also, the author gives great advice for preparing the meals, and provides some awesome lists for common ingredients and basic sauces. I thought this was incredibly helpful, because if you have most of the common ingredients on hand, you know right away that you have most of what you need for the recipes. Though the preparation time for most of these is longer than I typically like for slow cooker recipes, the time is worth it for delicious meals like these. For those who want to make good use of their slow cooker, definitely check this cookbook out. It's one of the good ones.